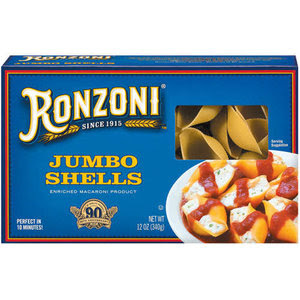 RONZONI SONO BUONI "RONZONI IS SO GOOD" Was The Slogan of AMERICA'S FAVORITE MACCHERONI .... When I was growing up it was the only pasta we ate. Our Favorites were Spahetti, Pastina, rigatoni and Stuffed Shells which my mother (Lucia Bellino) used to make a couple times a month. The Stuffed Shells were always a Special Treat, filled with creamy Polio Ricotta, Mozzarella and Parmigiano which we grated on a box grater from a nice big chunk. Never any of that Green Can Garbage (Kraft Parmesan) for us. Yes Stuffed Shells was a favorite of mine and my sister Barbara. Will be posting my Mothers Recipe soon. RECIPE For STUFFED SHELLS In Daniel Bellino-Zwicke's "La TAVOLA"